This is what the NTA looks like. At the top is some very important information — the Respondent’s name, address (or what the Department of Homeland Security believes is the current address), and the alien registration number. The alien registration number, commonly known as the “A number”, is how the court (and many of other immigration agencies) keeps track of individuals. “Section 237(a)(1)(B) [of the INA] in that after admission as a nonimmigrant . . ., you have remained in the United States for a time longer than permitted.” This is commonly known as the “overstay” charge: an individual entered the United States with proper authorization (as a tourist, or as a temporary employee), but remained in the U.S. after that authorization expired. “Section 212(a)(6)(A)(i) [of the INA] in that you are an alien present in the United States without being admitted or paroled.” This is the “catch-all” charge: The government isn’t sure how or when an individual entered, but a check of the database indicates that the Respondent has no current authorization to be in the United States. * I’m kidding about the rock and roll — just making sure you are paying attention. As in a criminal complaint, the alleged facts are geared toward supporting the government’s charges. In the criminal justice system, the prosecutor has the burden of proof to show that the evidence supports that a crime has occurred. In immigration, the government has the burden of proof to show that an individual is deportable. If the Department of Homeland Security is unable to meet that burden, then the Immigration Judge may “terminate proceedings” and decide that the government has failed to meet its burden to prove that an individual is subject to deportation from the United States. What happens if this section says “on a date to be set at a time to be set”? That makes it even more important to make sure that the Immigration Court has the correct address. 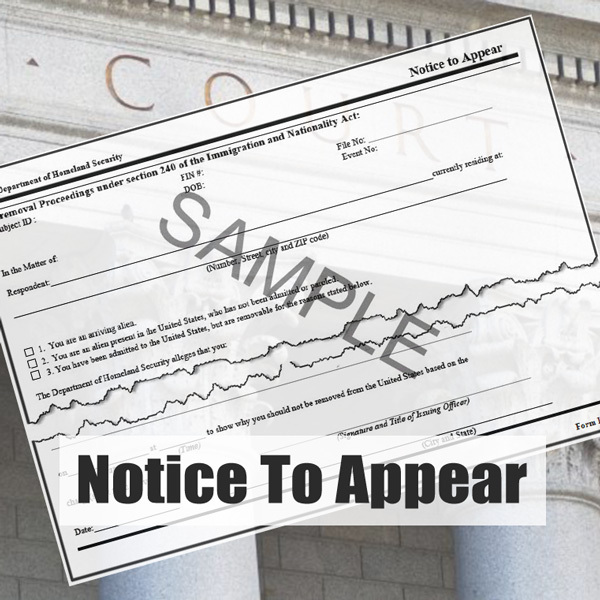 At some point, the Court will send a Notice of Hearing that provides the vital information regarding the date and time of the hearing. Respondents have the right to present evidence, challenge the government’s evidence, cross examine witnesses, apply for relief from deportation, and appeal any adverse decisions by the Immigration Judge. And, not to put too fine a point on it, but that requirement about notifying the Department of Homeland Security and the Immigration Court of any address changes: right there on page 2. If you are interested in discussing your situation in more detail, I invite you to contact me.